“Who’s going to do what Dag did,” I was asked by two track and field officials just after a vigil in his honor at the A. O. Shirley Grounds on Oct 20. “A lot of people who took what he did for granted in past, will now have to pull their weight,” was my simple response. Just after Dag Samuels took up coaching as an 18 year old after realizing he wouldn’t progress far in the sport, he began a journey based on love, dedication and pure commitment. His greatest trait was taking initiative and his actions spoke volumes while others sat and talked. Reflecting on his contribution to the development of the sport, Samuels singlehandedly had the greatest impact on British Virgin Islands Track and Field in its 47-year history. 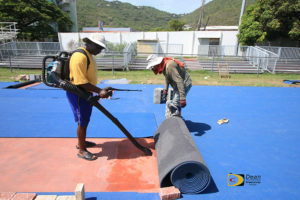 Shortly after entering the coaching profession in 1979, Samuels would eventually find himself marking the 300m track with old engine oil at the New Recreation Grounds, which later became the A. O. Shirley Grounds in 1988, named after a man who advocated for the development of cricket and convinced the administrator at the time, to use the once swampland for the sport and others. From the early 80s Samuels learnt the intricacies of marking the track even when it was extended from 300 to 400m in 1986, through 2004 when work began laying a Mondo surface that finally opened in 2008. Besides the A. O. Shirley Grounds, depending on the ground, Samuels marked 150/200m tracks at the Millicent Mercer Field in Baughers Bay, the Greenland Recreation Grounds, the Capoons Bay Grounds and the Valley Recreation Grounds on Virgin Gorda, so primary schools could have their respective sports before everyone began using the A. O. Shirley Grounds where he managed and then set the schedule for each school’s use of the facility. In later years, he used his expertise for consultancy. 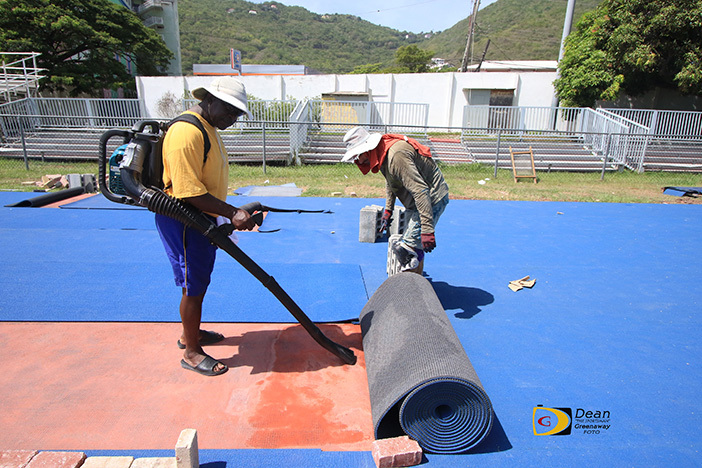 When the Mondo track was being relayed in fall, 2015, it was Samuels who oversaw the entire operation and pitched in from time to time with the workers, though he didn’t have to. Along with the late Lenford Levy, since 1994, Samuels has been the lead in the Development Series of competitions that began that year, setting meet dates along with external competition in consultation with regional contacts, then the competition event schedule, in conjunction with the coaches. Athletes will then try to meet the qualifying standards for competitions such as the Carifta Games and Pan Am Jr. Championships. The biggest impact of his loss will come when the 2018 season starts. In his trademark hat with a towel underneath, a long sleeved shirt and long sweats to protect from the elements, the countless and meticulous hours he put into competition day ensuring that everything from set up to breakdown would go smoothly, is immeasurable and will be missed. He was the pulse of the meet, with knowledge of every facet. Samuels knew who was the best personnel or combination for every competition area and those who were dependable. He was a master of setting up a meet, especially a major meet with flow and excitement and always saving the best event for last, whatever that event was, as it was never the same. Samuels’ administrative acumen, insight, experience and connections to get things done, will be sorely missed, because he was a people person. He brought a passion to his work. With all that he did on competition day, he still followed the performances of his athletes and had a word for them especially if it was a bunch of the droppings of a bull in his opinion, he’d surely let them know. Incorporating events in the Development Series targeting Primary Schoolers preparing for the annual Inter Primary Championships, was among ideas he brought into the competition. Samuels who would have turned 56 on Nov 3, always had an idea for improving the development of BVI Track & Field. We’ll certainly not see the type of commitment and selfless dedication he had for the sport. His actions spoke much louder than his words and he will be missed.